The Futures Forum’s investigation into Scotland’s culture and society in the future continued with a discussion of our working lives in 2030. Participants heard a presentation from Jo Salter, a director at PwC (and the UK’s first female fast jet pilot) on its “Workforce of the Future” project. 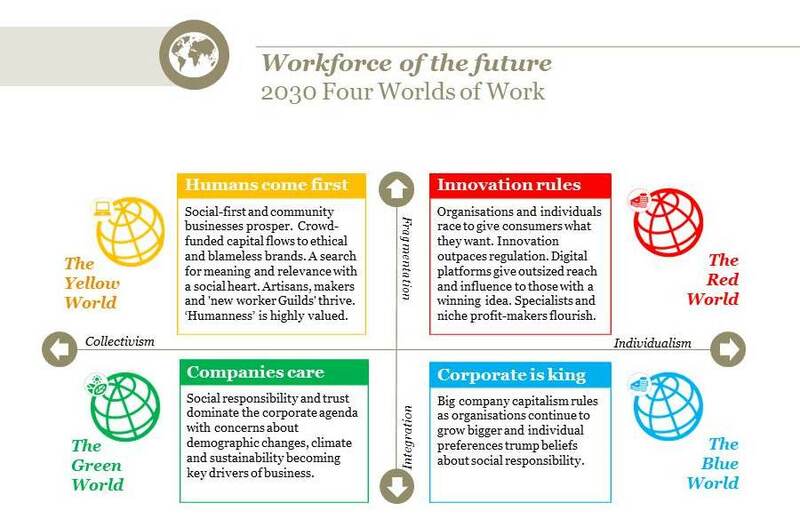 PwC, a multinational network of professional services companies, has brought together research and a specially commissioned survey of 10,000 workers in China, India, Germany, the US and the UK to produce four scenarios for the workforce in 2030. The four worlds are based on two axes: from fragmentation to integration, and collectivism to individualism. Jo-Anne Chidley, the founder of Beauty Kitchen, an award-winning company that creates 100% natural and effective beauty products. A chemist, herbal botanist and beekeeper, Jo also acts as an ambassador for Women’s Enterprise Scotland, a not-for-profit company that works to create an environment in which women-led businesses can flourish. Dave Devenney, head of programmes at Fathers Network Scotland, which works to build a father-friendly world. Dave has served as a police officer in Glasgow, in the Royal Marine Commandos, as a parish minister in the Church of Scotland and as team leader in a prison project for a UK charity. He is a dad to two grown-up children and a hands-on granddad. The debate was chaired by Gillian Martin MSP. The discussion covered gender equality in the workplace, including making jobs in the caring sector (one likely to grow in all scenarios) more attractive to both genders. In looking at how the technological innovations of the future might help or hinder gender equality, it was noted that technology has already offered us a greater flexibility in our working lives which has allowed parents (of both genders) to better manage their work and home life. However, scepticism was expressed about whether all women would enjoy some of the anticipated benefits of further technological innovations such as greater part-time work and more free time. How is increasing automation of labour likely to affect gender equality in the workplace? Interesting question at @ScotFutures event on the future of work in Scotland. While STEM jobs will be increasingly important in the future, especially jobs in IT, it was noted that these are sectors that have traditionally been dominated by men. Statistics were cited from the US which suggested that the number of women training as computer programmers has actually dropped over the last 25 years. 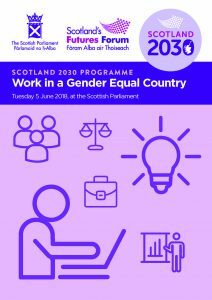 Finally, the view that equal pay would follow once we had achieved gender balance across all sectors was disputed, with an alternative view put forward that equal pay needed to be in place before gender balance could be achieved in all sectors.